Thousands of websites across the United States are taking part in an online protest of the government's proposal to roll back rules over net neutrality. Facebook, Twitter, Google and dozens of other major technology companies are participating in an online protest on Wednesday to oppose proposed changes to U.S. net neutrality rules that prohibit broadband providers from giving or selling access to certain internet services over others. In support of the "Internet-Wide Day of Action to Save Net Neutrality," more than 80,000 websites are displaying alerts, ads and short videos to urge the public to oppose the overturn of the landmark 2015 net neutrality rules. Net neutrality is a broad principle that prohibits broadband providers from giving or selling access to speedy internet, essentially a "fast lane," to certain internet services over others. The rule was implemented by the Obama administration in 2015. The changes are being proposed by the head of the U.S. Federal Communications Commision, Ajit Pai, appointed by President Donald Trump in January. The public will have until mid-August to send comments to the FCC before the final vote. Pai wants the commission repeal the rules that reclassified internet service providers as if they were utilities. He thinks the open internet rules adopted under former President Barack Obama, a Democrat, were unnecessary and harm jobs and investment. Twitter and Google, part of Alphabet Inc., expressed in blog posts their support for the existing net neutrality rules, encouraging users to participate in the online protest. Twitter was also promoting the hashtag #NetNeutrality throughout the day. "Net Neutrality is foundational to competitive, free enterprise, entrepreneurial market entry — and reaching global customers. You don't have to be a big shot to compete. Anyone with a great idea, a unique perspective to share, and a compelling vision can get in the game," Twitter said. Popular online forum Reddit displayed a slow-loading logo and a pop-up notice warning its users of the risks associated with repealing net neutrality rules. One of the top posts on the forum was "Your online gaming is once again at risk. Net Neutrality needs your help." 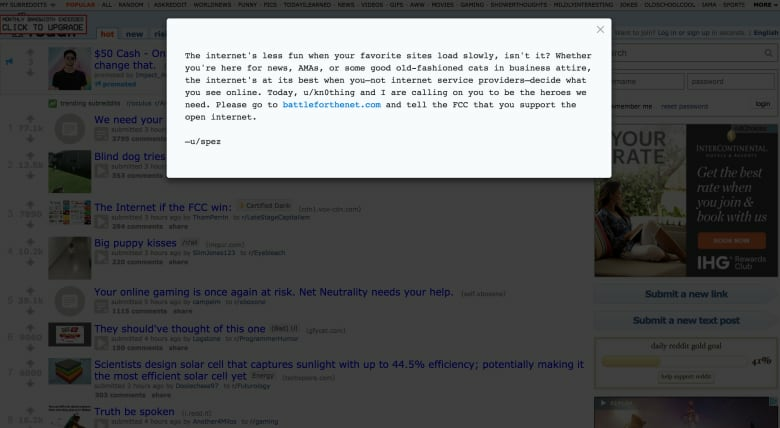 A notice posted on the Reddit frontpage, outlining the company's commitment to Net Neutrality. 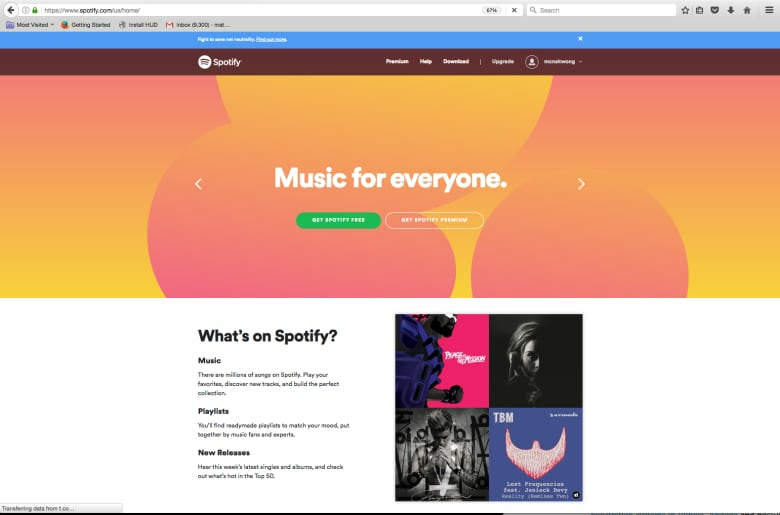 Others like Netflix and Amazon Inc displayed banners on top of their home pages or posted short videos explaining net neutrality, urging consumers to send comments to the FCC. Internet provider AT&T also joined the big protest even though the wireless giant in the past has disagreed with staunch net neutrality advocates over how to enforce it. The Internet Association, a group representing Facebook, Google and others, has said the rules were working and that reversing them "will result in a worse internet for consumers and less innovation online." Net Neutrality advocates, like Canadian Cory Doctorow, co-editor of Boing Boing, explain that what's at stake is the ability to access the internet at a reasonable price, unfettered by the restraints of cost. "It's the poor who suffer disproportionately because they're the ones with the least to ability to pay," Doctorow told CBC News. Doctorow also suggested that Canada might inadvertently benefit from the U.S. rolling back existing net neutrality protections. "Maybe if the Americans screwed up enough, there'll be some space for Canadians to enter the market," said Doctorow. "Maybe we'll get another fresh round of entrepreneurs who come to Canada to do their own thing in our country." 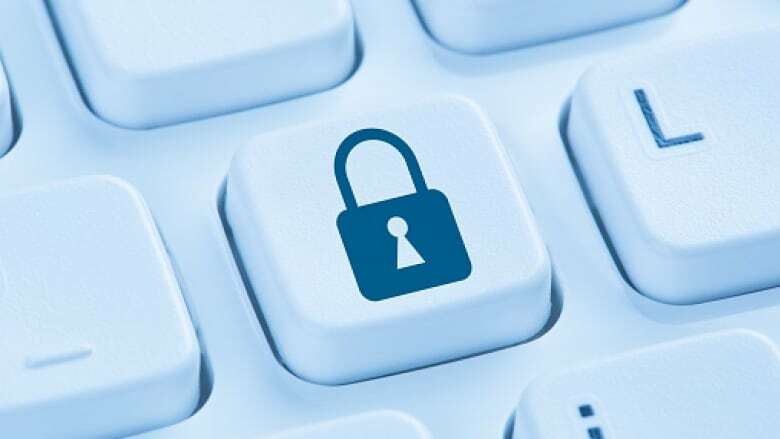 As for Canadian internet subscribers worried about their own digital services, Canada's Liberal government has not expressed a desire to rollback existing net neutrality protections afforded to Canadians.